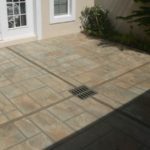 It is important to consult with a professional contractor to find out what types of flagstone patterns they have to offer and which one would suit your patio best. 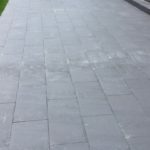 Slate is known for its fine-grained surface and high-resistance to weather. It is commonly gray in color but there are certain parts of the world where slate come in green, cyan, and even purple. This is popularly used as a roofing and paving material because of its fissility, which is a property of slate to form smooth flat sheets when cut. Fractured slate is one of the most popular stamped pattern and texture for concrete patios, driveways, and even pool decks. Travertine is a type of limestone that is often derived from mineral springs. It comes in light hues, such as white, tan, cream, and the likes. There are a few rustic varieties caused by the presence of iron carbonate. This type of natural stone pattern is popular for both patios and pool decks because of its heat-reflective colors. This is one of the most popular sedimentary rocks that contain skeletal fragments often of marine organisms. It is a popular building material because it is easy to cut, durable, and long-lasting. However, it is a very heavy material, making it expensive since it needs to be transported by a heavy-duty truck. 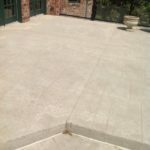 The look of limestone blocks on a patio can be recreated with concrete stamping.